Eped Inc. (EPED) is a leading technology developer of surgical navigation systems for minimally invasive surgeries in Taiwan. It has already independently developed many hardware and software for minimally invasive surgeries, including clinical technique assessment and guidance system for dentistry, clinical implant navigation system, navigation and training system for minimally invasive surgery. 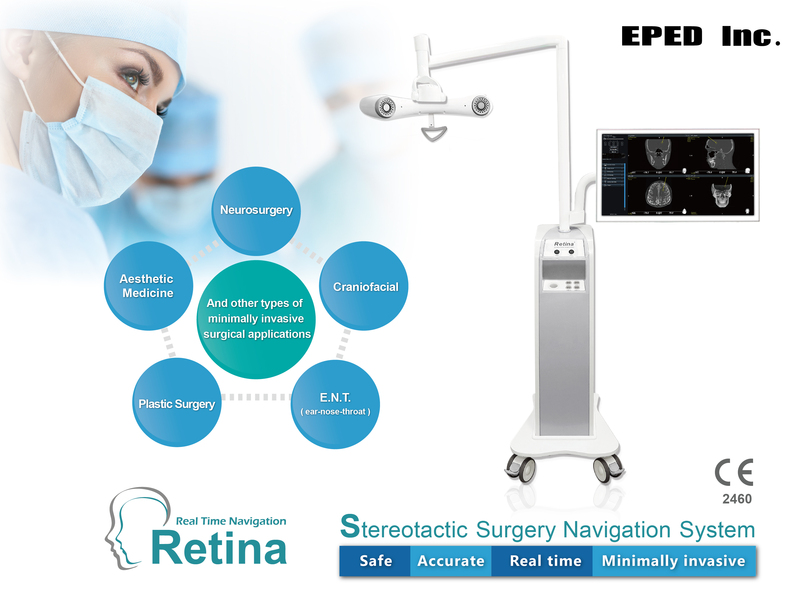 EPED 's latest product, the Retina surgical navigation system, will be unveiled at this year's Taiwan Healthcare+ Expo to mark EPED 's entry into the surgery market. At the Taiwan Healthcare+ Expo, EPED hopes to accelerate collaboration with the healthcare system in Taiwan in specialist training, while also looking for global distributors and agents to export their technology to the world. EPED owns the key optical positioning technology that is highly precise, with an RMS error of 0.1016 mm, surpassing all other optical tracking systems in the world. The company leverages the above technical advantage through the development of software interface and establishing an instrument database, leading to an extremely flexible design for the surgical navigation system. The result is the Retina, an integrated surgical navigation system that can adapt to different settings and environments. The Retina can be used in the navigation of neurosurgery, craniofacial surgery, plastic surgery, ENT, aesthetic medicine, and various minimally invasive surgeries. It integrates medical images from methods such as 3D CT Scans and MRIs so surgeons can rely on more than just their experience and proprioception when operating in locations obscured from sight, assisting them perform the navigated minimally invasive surgery. One other feature of the Retina is its compatibility with other instruments, allowing for accurate and safe outcomes. The result significantly lowered risks from surgery and shortened postoperative recovery while achieving smart healthcare and precision treatment. The Retina Surgical Navigation System obtained TFDA approval in 2017 and the EU's CE certification in 2018. EPED has released the SimEx dental clinical technique assessment, evaluation, and guidance system, designed to provide AR training that simulates the actual clinical environment. With a machine that is similar to the ones in the clinic and real-time image feedback, the system allows dental students, interns, and dental professionals to train. The system not only provides assistance for operating with standardized treatments, it also records the training process which allows for real-time mistake feedback, or for reviewing previous operations. The SimEx satisfies the need for a realistic 3D interactive real-time simulation system. The system is currently adopted in large numbers in Thailand and China, and has successfully been sold to countries such as Japan, Korea, Vietnam, Australia, Kazakhstan, Russia, Malaysia, India, and Saudi Arabia. In the future, EPED will leverage its optical navigation technology to develop optical scanning instruments and accessories, including 3D scanning devices, surgical robotic arms, AR glasses. Visit booth No. I134 for more information about Eped Inc.